A recent article in the Sydney Morning Herald declared that the director of Opera Australia “is staking much of the future and reputation of the national opera company on a digital revolution designed to immerse audiences and create an experience more akin to watching a movie than traditional opera”. To deploy a shopworn phrase usually applied to shows where the story is weak but the physical production stunning, it sounds as if there’s a desire to have Sydney opera-goers come out humming the scenery. The article focuses on the opera company’s extensive use of flat-screen video technology in its upcoming production of Aida. I write with no knowledge of the Australian opera scene and limited knowledge of current opera production, but it sounds as if the company under discussion is simply coming up to speed with technology that has been in use in theatre for quite some time, whether through flat screen or projections, and grappling with it in contrast to the usual grand, corporeal scenic realisations for which opera has become well known. From Wendall Harrington’s projection work on Tommy to William Dudley’s kinetic video for The Woman in White, from Timothy Bird and Knifedge Creative Network’s unfolding video imagery for Sunday in the Park With George to Aaron Rhyne’s work on the current Broadway musical Anastasia, semi-virtual scenery is hardly the new kid on the block theatrically. The aforementioned are just a quick survey of examples, and of course the technology is constantly evolving. Video technology has already reached the stage in the US where high schools are using it to simplify their construction needs, and pre-existing video designs can be rented along with the equipment needed to present it. 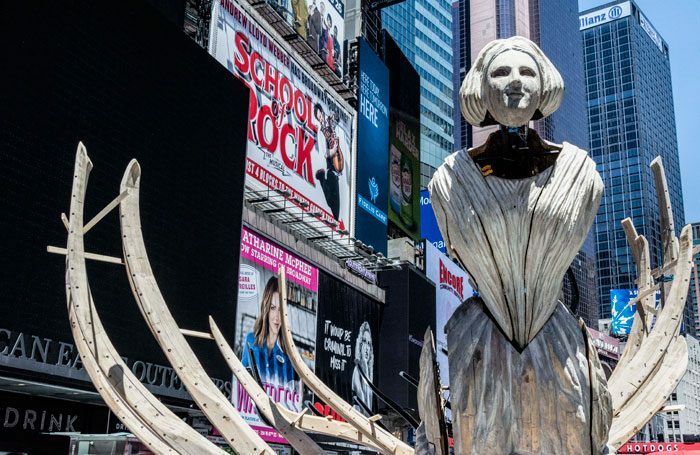 The Herald article caught my eye only a few days after I had been captivated by an art installation in Times Square, which I watched being erected over a period of several days. Wake, by Mel Chin, is a large-scale sculptural representation of a sailing ship’s prow, with the ribs of a hull behind it. 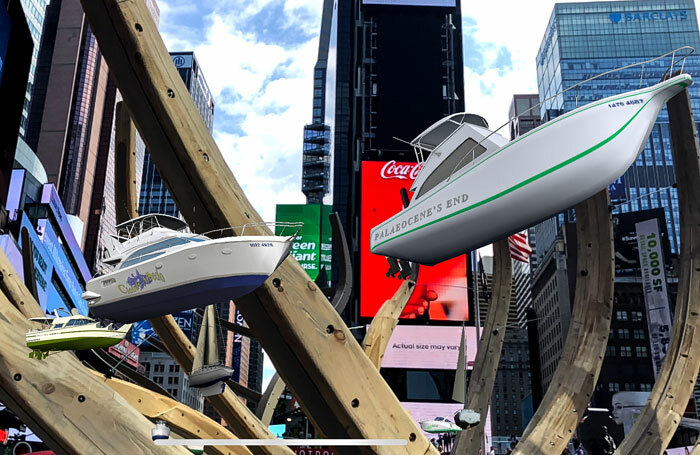 Rather than simply being a fixed work of art (until the end of summer, in this case), Wake is complemented by Unmoored, an augmented reality work which – when viewed through the use of video goggles or a mobile phone app – creates the sense of Wake being more fully rendered as a completed hull while other seafaring vehicles sail overhead in Times Square. If you’ve ever wanted the experience of looking up at a cargo ship as it floats by you and the copious signage in the center of Manhattan, Unmoored is the work for you. Why do I yoke these two seemingly disparate works, one in the confines of a venue I’ve never seen, the other which I observed in the open air? Because even as video screens are remarked upon as innovative in Australian opera, augmented reality is transforming how and where we can interact with art, including performance. Unmoored put me in mind of Elements of Oz, a play I saw a couple of years ago at the innovative 3-Legged Dog venue in lower Manhattan. At this production, audience members were encouraged to hold up their phones while watching, only to see a tornado and poppy field appear (at separate times) alongside the action we were observing played out on a relatively empty stage before us. While I don’t look forward to watching plays while holding up my mobile phone (ringer off, of course) for two hours, technology is beginning to offer ways for companies to create more immersive worlds without the construction of physical scenery. As work increasingly bursts out beyond prosceniums, augmented reality may offer possibilities to performances anywhere people can congregate, but without the need for lugging scenery into parks and playgrounds. As someone who resists the efforts to brand movies such as Disney’s most recent The Jungle Book, which are largely computer animated, as ‘live action’ – they are in fact simply photo-realistic simulacrums of reality – one might think I would find the implementation of film and video into live theatre to be troubling. But so long as we’re seeing stories played out by real people in front of us, humans speaking (and singing, dancing and making music) for other humans, and so long as that is the central part of the experience, I’m rather excited by the possibilities that technology continues to bring to the stage – or the jungle, be it exotic or urban. A long-running Broadway hit in the latter half of the 1990s, the Leiber and Stoller revue Smokey Joe’s Cafe returns to Manhattan this week in a new Off-Broadway production at Stage 42, formerly the Little Shubert, on 42nd Street. Joshua Bergasse is the director-choreographer seeking to encourage audiences, to cite one of Leiber and Stoller’s big hits, to take a big swig of Love Potion No. 9. It opens Sunday. Monday night marks a Broadway milestone as Young Jean Lee becomes the first Asian-American woman to have a play on Broadway, with the opening of, ironically, Straight White Men, previously seen in New York in a separate production at the Public Theater in 2014. Anna D Shapiro directs. This Ain’t No Disco, the latest work from Hedwig and the Angry Inch composer Stephen Trask, along with Peter Yanowitz and Rick Elice, is a rock opera set in the fabled nightclub days of Studio 54 and the Mudd Club. Darko Tresnjak directs for the Atlantic Theater Company, where the show opens on Monday. Avenue Q’s Jeff Whitty had the idea to mash up Philip Sidney’s poem Arcadia with the music of 1980s band The Go-Go’s and the result is Head Over Heels, opening Thursday at Broadway’s Hudson Theatre. Retooled since its 2015 premiere at the Oregon Shakespeare Festival, the songs are intact but Whitty’s book is now adapted by James Magruder, while Michael Mayer directs. Mark Shenton: What does The Stage survey tell us about the future of theatre criticism?